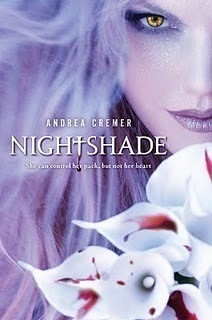 I was completely blown away by Nightshade. I had read so many great reviews about it, so I had some pretty hefty hopes for it. But Nightshade reached above and beyond, splintering any preconceived notions I had and shattering the standards I set for novels. I haven’t read a book that well written, well paced, perfectly plotted, and wonderfully executed since Harry Potter. And you know I mean business if I’m comparing it to Harry Potter. At first, I had no idea what was going on. I just knew there was a girl named Calla that was a werewolf, and a boy who got mauled by a bear. But the more I read, the more things fell into place, and the world was spun together around me, thread by thread, until I was lost in it. I would constantly be hiding the book under my text books in class, or whipping it out any time I could get my hands on it. Calla was a great female protagonist. Being a female alpha, she was forced to remain completely chaste until her union with the male alpha of the other wolf pack, Ren. (*swoons*) She’s seventeen and she’s never been kissed… Until now. The great thing about her was that she was so tough and badass, but inside she was a normal teenage girl that just wanted to be kissed and held and loved. She was loyal to her pack, but she envied her packmates their freedom to love who they wanted, while her mating with Ren was determined at their birth. And then she falls for Shay, and her world is turned upside down. Reading about the process of them getting to know each other was definitely a highlight of the book. Which brings me to Shay. I actually didn’t like Shay when he was first introduced. In comparison to Ren, Shay was a little… weak, I guess. But throughout the novel he gained strength and a little thing we Hispanics like to call cojones. I fell in love with Shay as quickly as Calla did, but not more than Ren. The history of the Guardians and Keepers was intriguing, and I applaud Cremer for creating a new world in one that’s been written about to death. The best thing about this book, and the entire premise of the Guardians and Keepers, is that you may believe one thing, and then all of the sudden BAM, you’re entire opinion changes with one revelation, or one thing that a character said. Andrea Cremer certainly knew how to keep the reader holding their breath. I did have a few issues with the book, but they certainly did not outweigh me enjoying it as much as I did. Firstly, how the novel stressed Calla’s unwillingness to be feminine. As a girl, I feel that it’s sort of second nature to want to look pretty and wear cute things. I know very few unfeminine girls, and even they love to go shopping and play dress up once in a while. I think that it was slightly unrealistic how Calla was refusing to wear cute clothes, or makeup. Secondly, the special connection Calla and Shay felt ever since the moment they met. I’m not one who buys into those things. I actually really dislike when authors describe their characters feeling that way towards each other when the characters don’t know each other. I mean, it’s cliché. I understand the connection once they started talking, and they got to know each other more. But before that? Not a good idea. This was quote possibly my favorite book of the year. It’s going to be very difficult to top this one. And that cover is to die for.